This month has been a little odd for me when it comes to nail art. I started off the month really well but then kinda lost my mojo when it comes to nails (and mainly nail art) somewhere along the way. I'm really not sure what happened but hopefully my mojo will be back sooner rather than later. Despite my nail funk, I did manage to do quite a few of manis that I consider favourites. This is probably a bit of an unfair category this month. I have shared four plates this month and they are all favourites of mine. 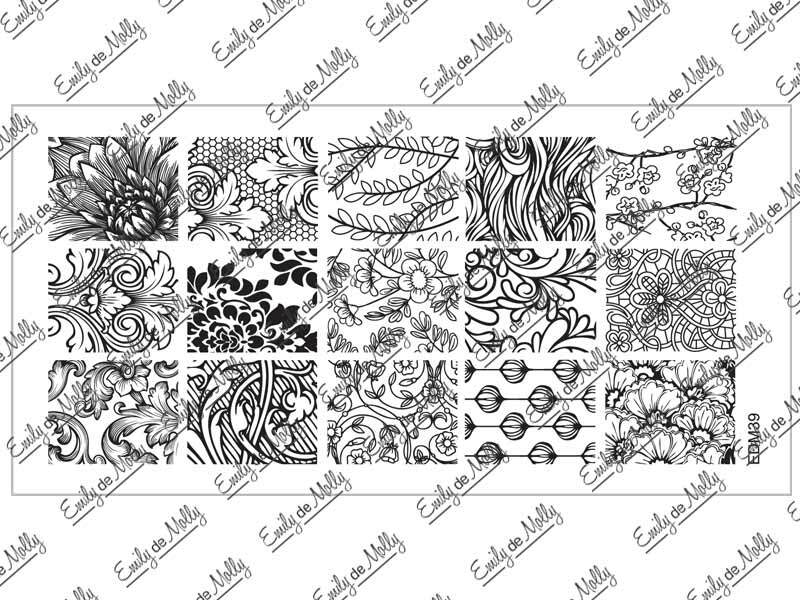 This plate has some of my all time favourite images that Emily de Molly have released in their stamping plates. Definitely makes it an easy plate to grab for continuously. I'm sure you can all see why I would be obsessed with this stamping plates. They make for perfect manis with a sponged background (which I think will still be my go to look for a while to come). 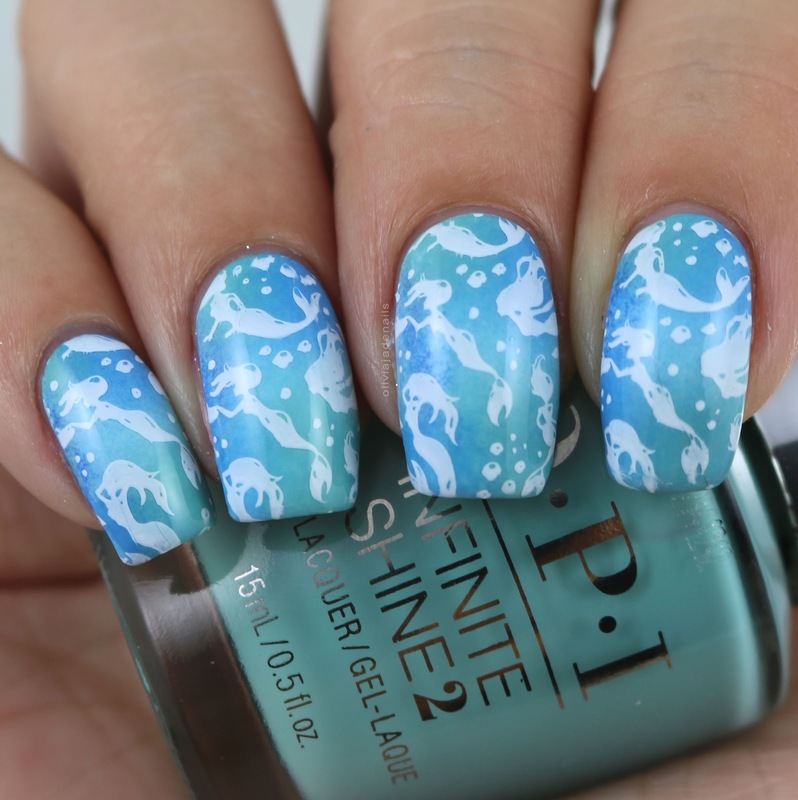 You can see some of the manis I have done with this plate in this post here. If you asked me what some of my all time favourite stamping plates are in my collection I would hands down be adding both of the Chevron plates from Uberchic. Seriously obsessed with the designs. You can see my post of Got Chevron 02 here. Such a girly plate! I'm pretty sure this plate was released with Valentine's Day manis in mind but I'll be using it all year round. 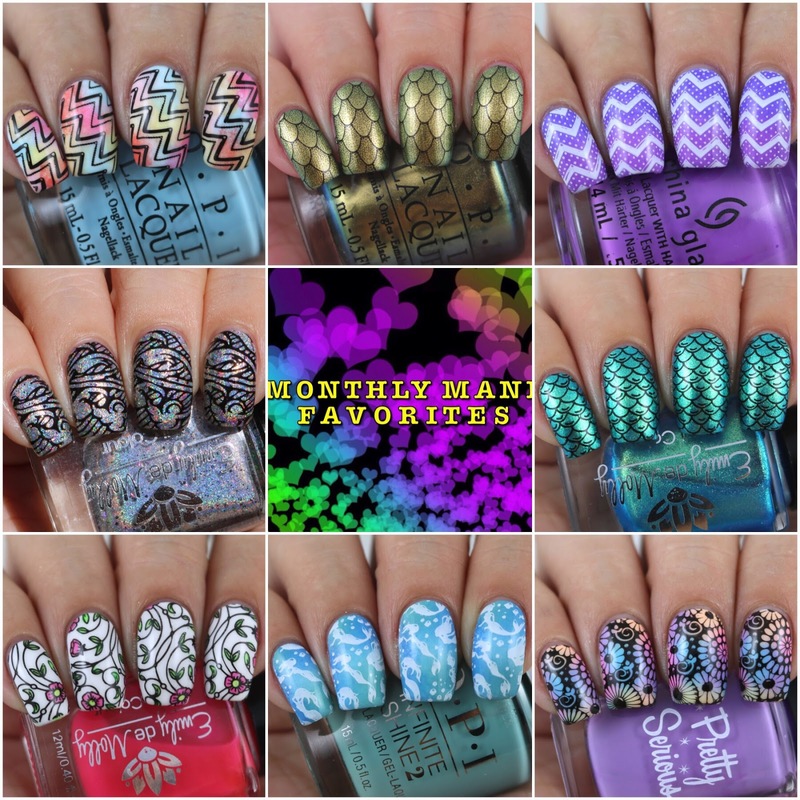 You can check out my manis in this post here. February is a lot like January when it comes to new polishes on my blog. I have had zero mainstream polishes and I have only had one indie brand - Emily de Molly. Again, I have no issues with having Emily de Molly polishes to share (they are always in my favourites). Next month I will have some other new things from brands to share. With the exception of one polish, I really loved all of February's releases. My absolutely favourites are Linked Irony and Change Of Pace, closely followed by Ruined Cities and Little Whispers. Emily de Molly knocked it out of the ball park with this month's Polish Pick Up. Long Road Trips is seriously gorgeous and the formula is perfection. I am a huge fan of the Valentine's Day Trio that was released this year. Sadly, I didn't love all three once there were on my nails. I did fall in love with two of them though - Memory Maker and Streams Of Gold. That wrap's up February. It was definitely a quiet month so not too many favourites (or maybe still a lot of favourites depending on what you are comparing it too). Next month, I have a feeling that my favourites post will be much, much bigger. I have quite a few collections that I have began swatching and have already started to fall in love. Also in March I will be going back to daily blogging! I have so much new things to play with that if I stick to only doing four posts a week I will have content right up until June/July (without getting anything else). Polish Pick Up is just around the corner and there are lots of goodies available. 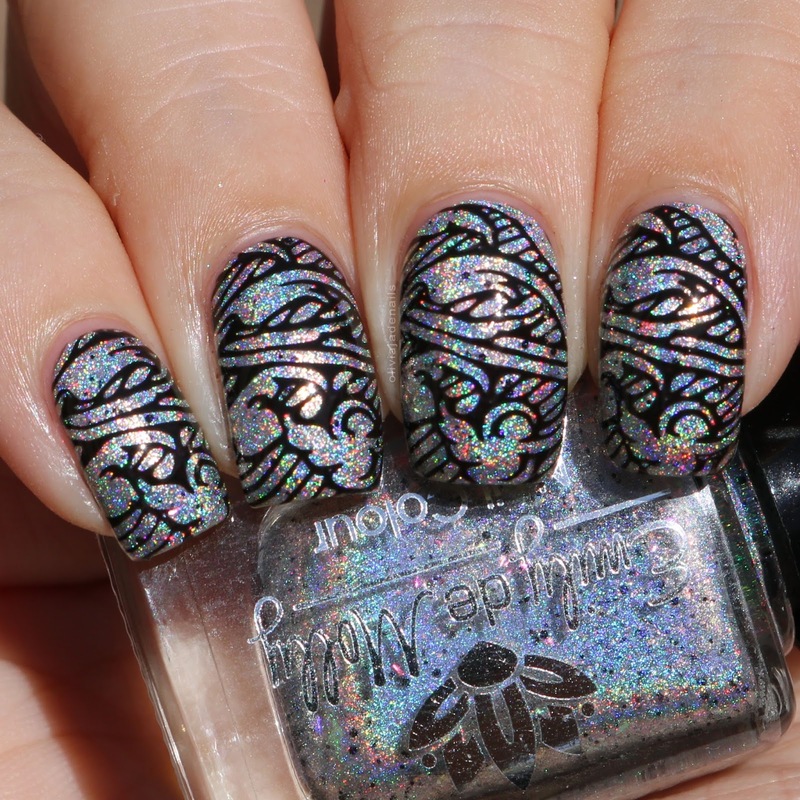 Joining this month is Hit The Bottle with their From Beyond The Greige stamping polish. I was sent this as a bit of a thank you gift but thought why not swatch and review it for you guys who may be interested in purchasing it. 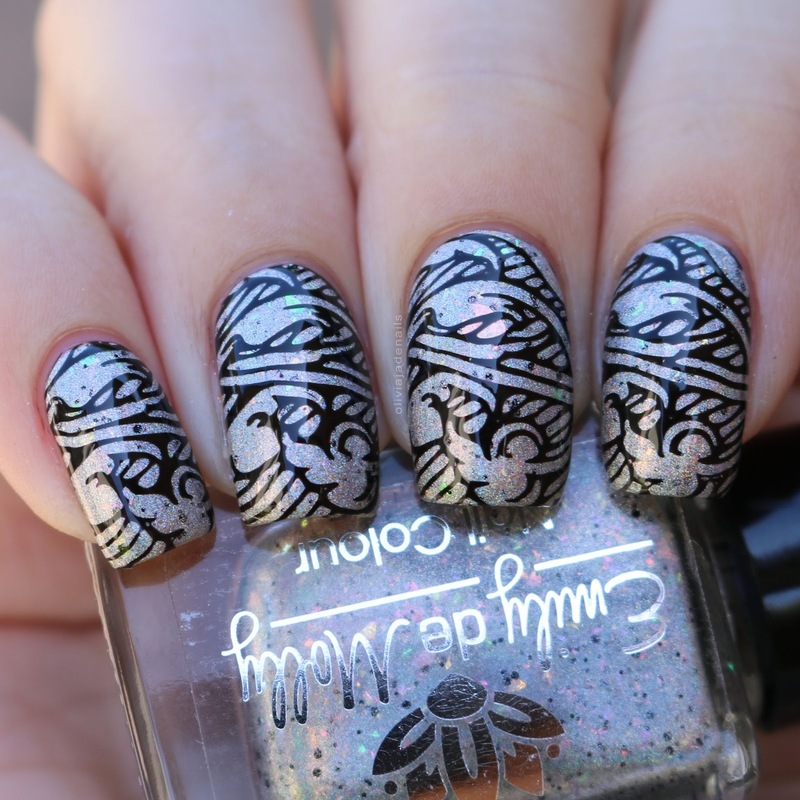 From Beyond The Greige is a greige stamping polish. This polish stamps great over light and dark colours. Personally I prefer it over lighter colours. 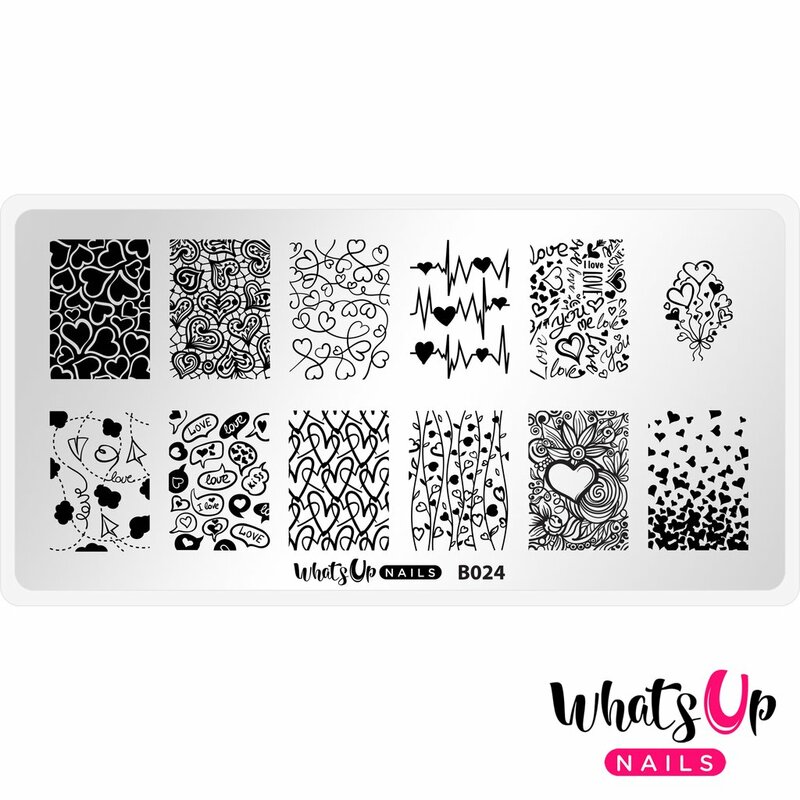 Image is from Lina Nail Art Supplies Let's Doodle 02 stamping plate. This polish can also been worn as a regular polish and is opaque in one coat! I seriously think I need to wear more stamping polishes as regular polish! 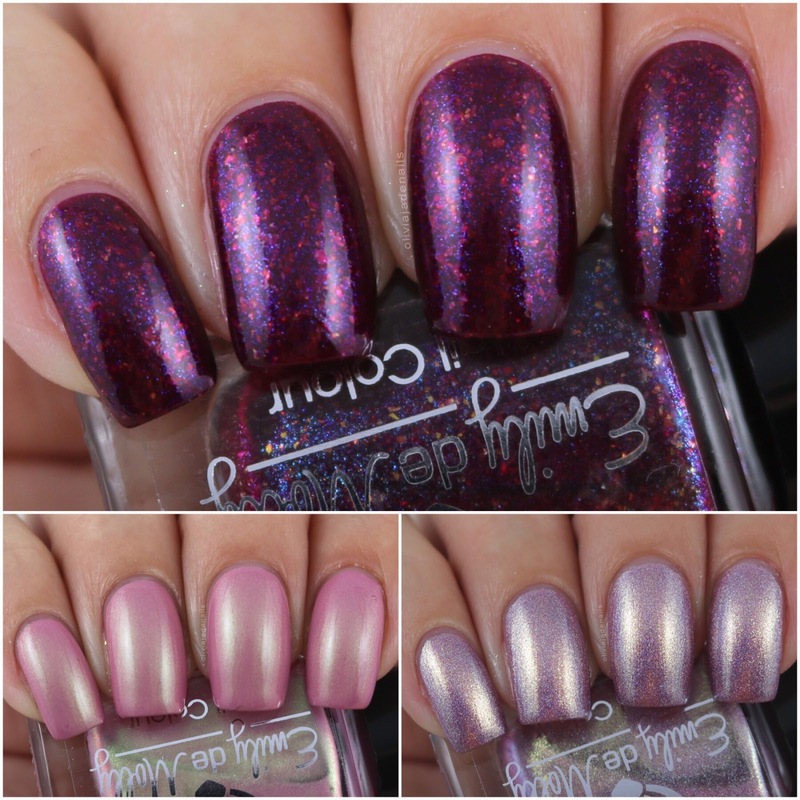 From Beyond The Greige will be available via the Polish Pick Up from Friday 2nd March at 11am EST until Monday 5th March. 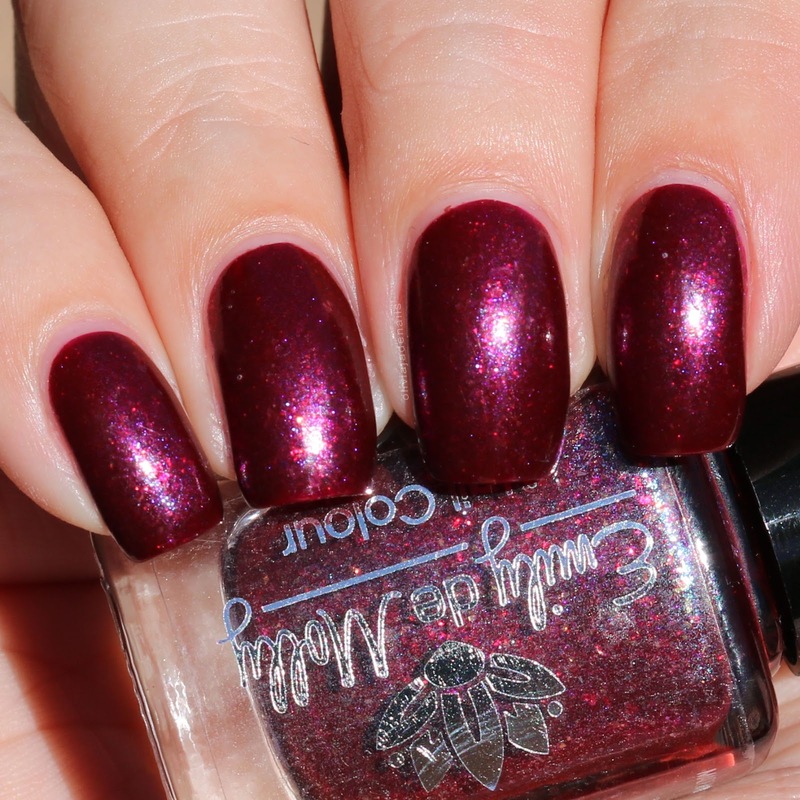 This polish is capped to 50 bottles so if you want to get it then grab it ASAP! It's getting so close to that time again....what time you may be wondering. Well the time when the Polish Pick Up goodies are available. If you are new to the Polish Pick Up then I recommend joining their Facebook group. It has all the information you need plus it is the best place to see all of the upcoming goodies. 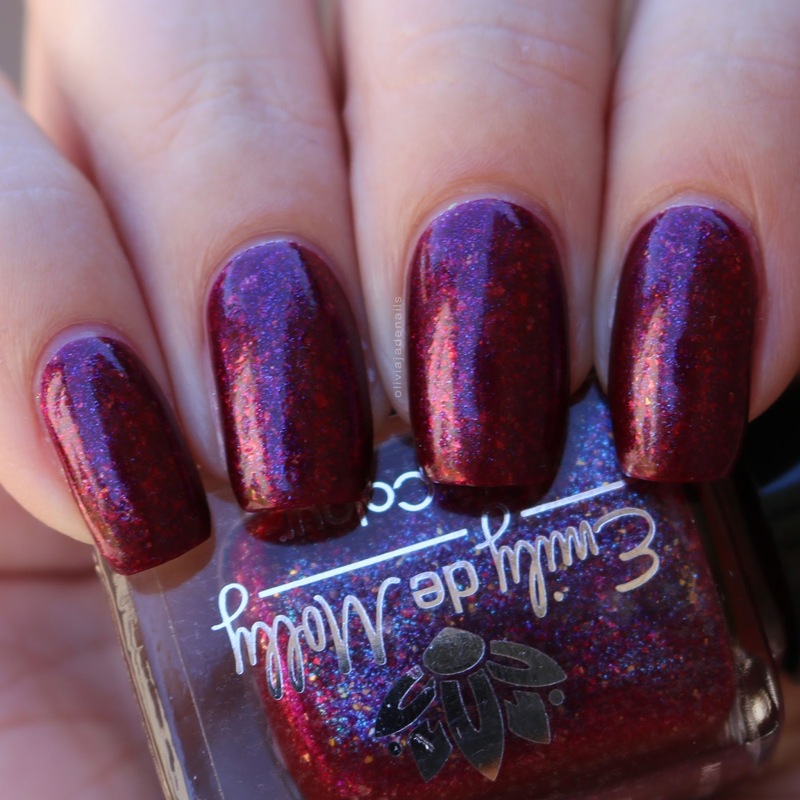 This month's theme is books and I have Emily de Molly's polish to share with you. 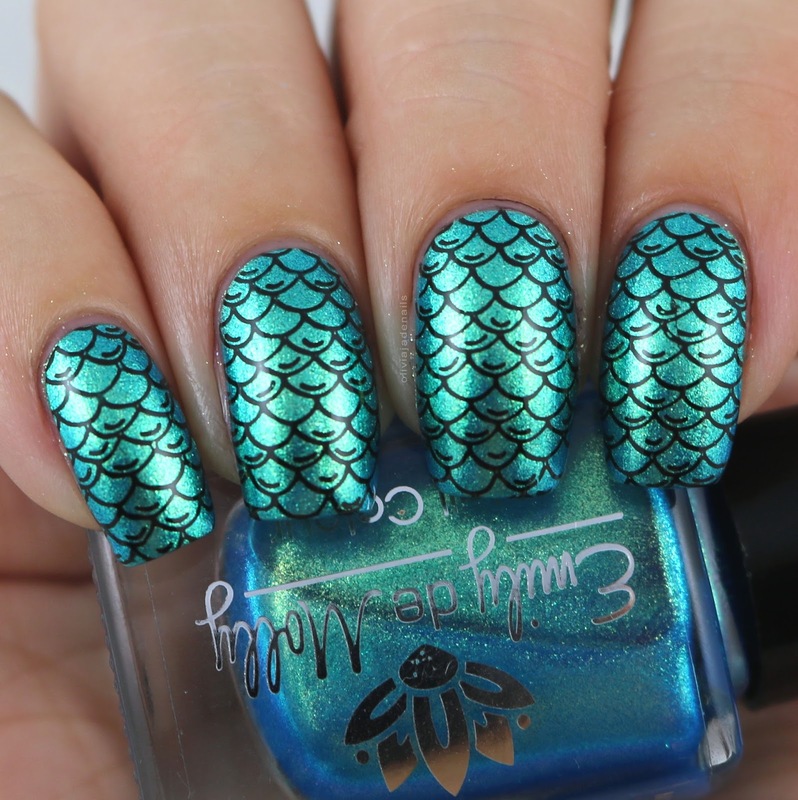 Long Road Trips is is a beautiful teal green holo with lots of gold shimmer and copper flakes. 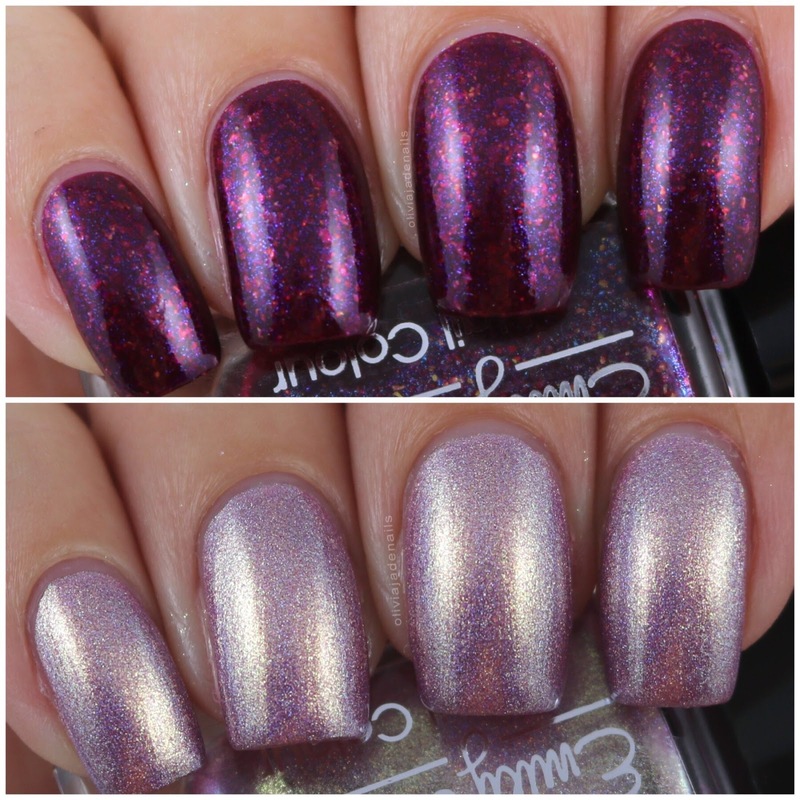 This polish is absolutely stunning! I love it! Not only is it a gorgeous colour but the formula is also amazing. It is so close to being a one coater (if you have short nails then you could easily get away with one coat). My swatch shows two coats. Have I mentioned that I love this polish? I actually wore it for a couple of days and I couldn't stop looking. I highly recommend it if you can get your hands on it. Long Road Trips will be available via the Polish Pick Up from Friday 2nd March at 11am EST until Monday 5th March. This polish is capped to 400 bottles so if you want to get it I highly recommend grabbing it ASAP. I'm such a bad blogger! I received this new Emily de Molly stamping plate a little while ago and I started to swatch it. I even posted a mani on Instagram. I just never got around to finishing swatching the plate and I definitely haven't reviewed it either. Until today! Today I finally have Emily de Molly's EDM39 to share with you. This first mani is done with a couple of things that I love. 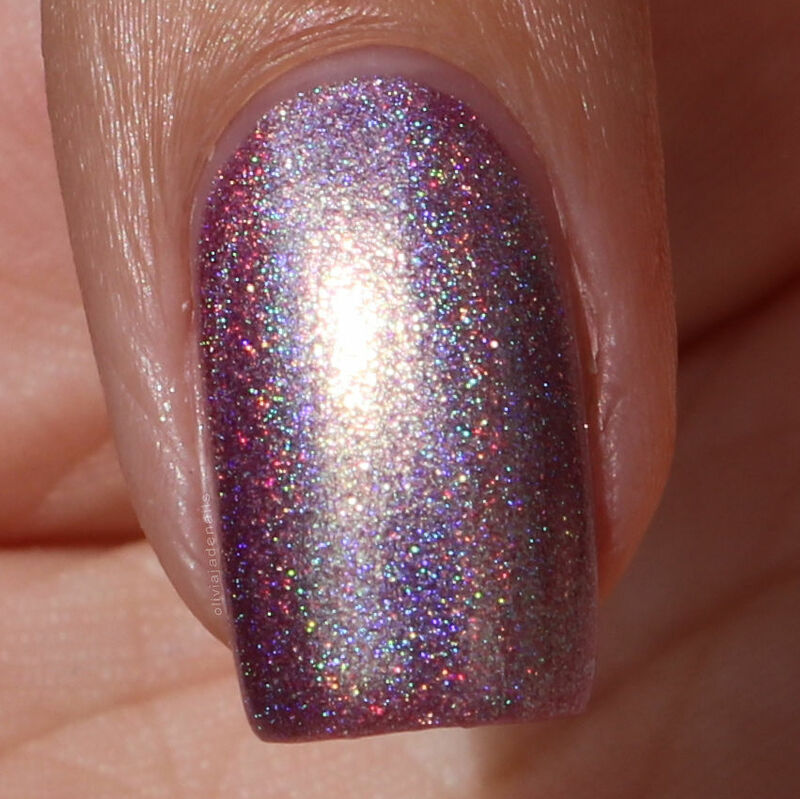 Firstly, the polish is Linked Irony (from this month's polish release - it's amazing and I think everyone needs it in their collections) and secondly, the image! It's one of my favourite images that Hayley has done. There is something about this next image that just screams lead lighting to me (or decal - but I don't have much luck when it comes to decals). For my base I used Pretty Serious Cosmetics Presence and then used Emily de Molly sheer tints in Neon Pink, Neon Green and Neon Yellow to fill in the design. This next image is probably my all time favourite images that Emily de Molly has on all of their plates. I have used it time and time again and I love it each time. Polishes used are Emily de Molly Gazing Upwards and Bundle Monster Indikon. This is one of my favourite plates that Emily de Molly has released. There are so many great designs (which includes some of my all time favourites) and they all stamp beautifully. 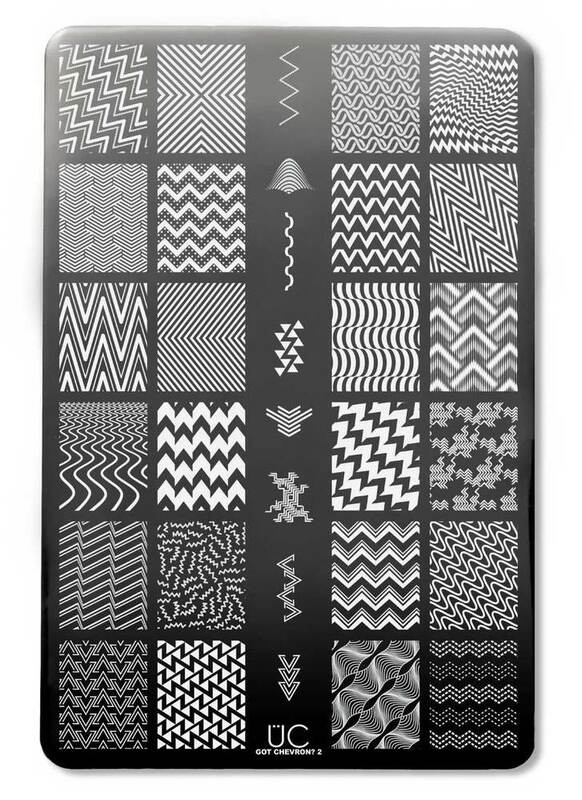 The EDM39 stamping plate is available now from Emily de Molly's Australian site and their International site. At the beginning of this week, I was seriously questioning whether or not I would make it through this week. Well I did it! Woohoo! I guess the Mythical Creatures theme wasn't as bad as I thought it was going to be. Anyway, this week I have done dragons, fairies and mermaids, but I couldn't skip over doing a unicorn mani. For my base I used Pretty Serious Cosmetics, and stamped using Bundle Monster's Quasar, TeePee Tipping, E-Tronica, Opus One, Astronomical and Monarch Dream. 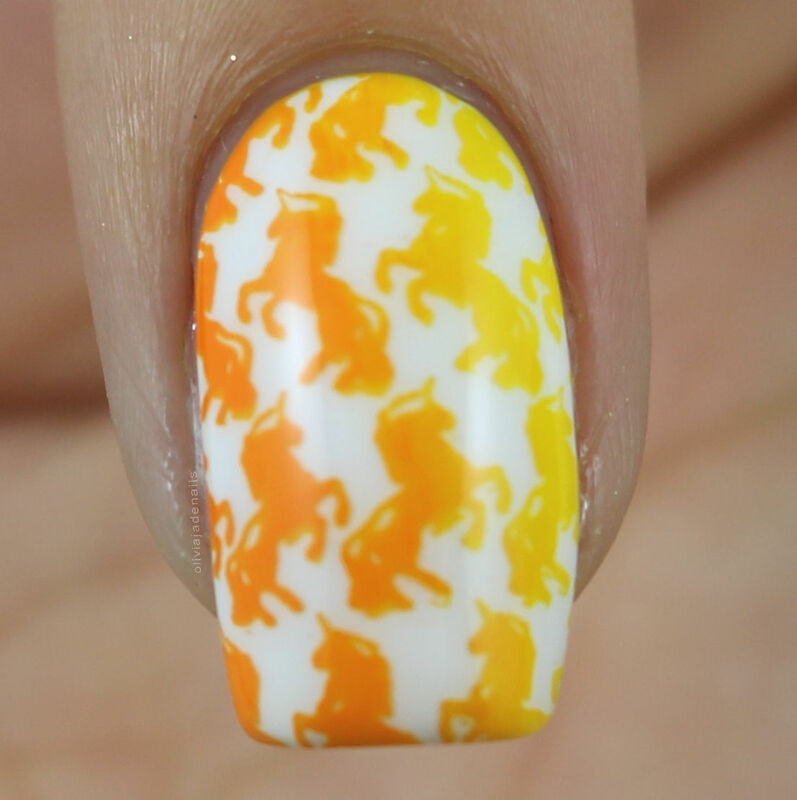 Stamping image is from Uberchic's Unicorn Love. I hope you guys have enjoyed this month's Digit-al Dozen theme. There has been some amazing manis from the other girls. If you haven't seen theme then I definitely recommend checking them out. 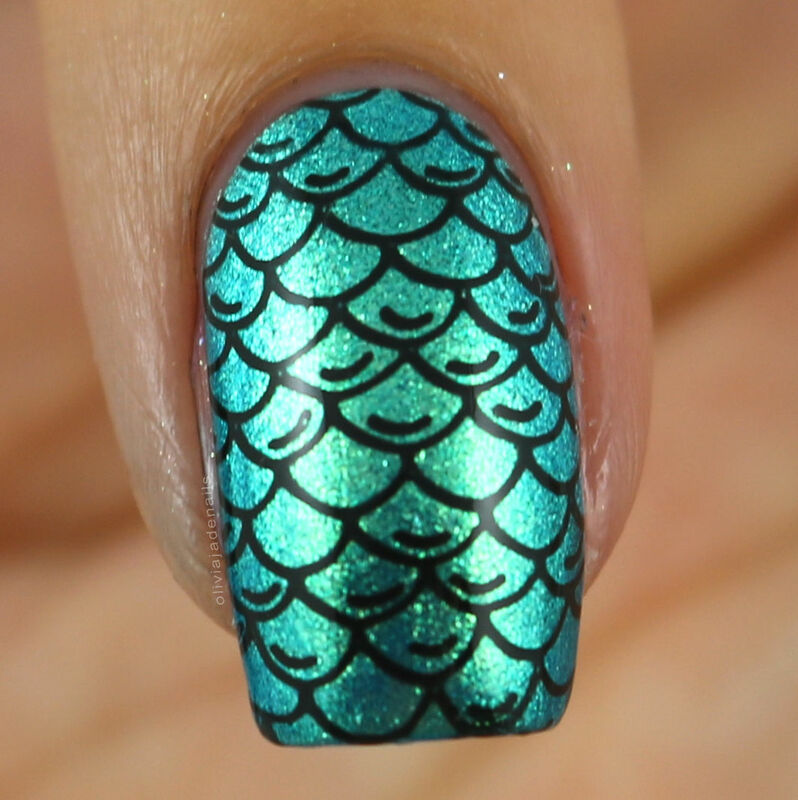 Yesterday I had full intentions of doing a mermaid scale mani but got side tracked by a different mermaid image. I could have skipped over doing mermaid scales seems I have already covered mermaids this week but I really didn't want to. Plus I was really struggling to come up with a fifth mani idea. I wanted to go really simple with this mani - because sometimes less is more. I love how these turned out and am so happy that I wore it as a full mani. Polishes used are Emily de Molly Water Balance and Hit The Bottle's As Black As Night. Stamping image is from Bundle Monster BM-XL212. I have covered mermaids, fairies and dragons this week. Does anyone want to take a guess what mythical creature I plan on doing for tomorrow? 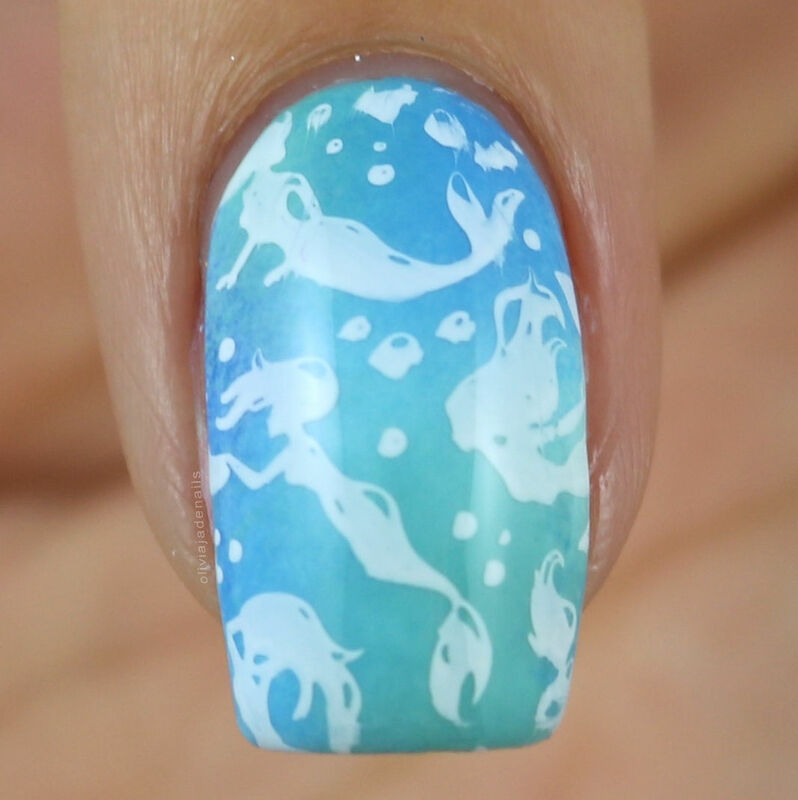 I knew that this week I needed to do mermaid nails. I had originally planned on doing mermaid scales for today, however I then saw these swimming mermaids and thought they would be really pretty with a blue sponged background so that is exactly what I did. For my base I used OPI No Room For The Blues, Suzi Without A Paddle, Closer Than you Might Belem and Tile Art To Warm Your Heart. 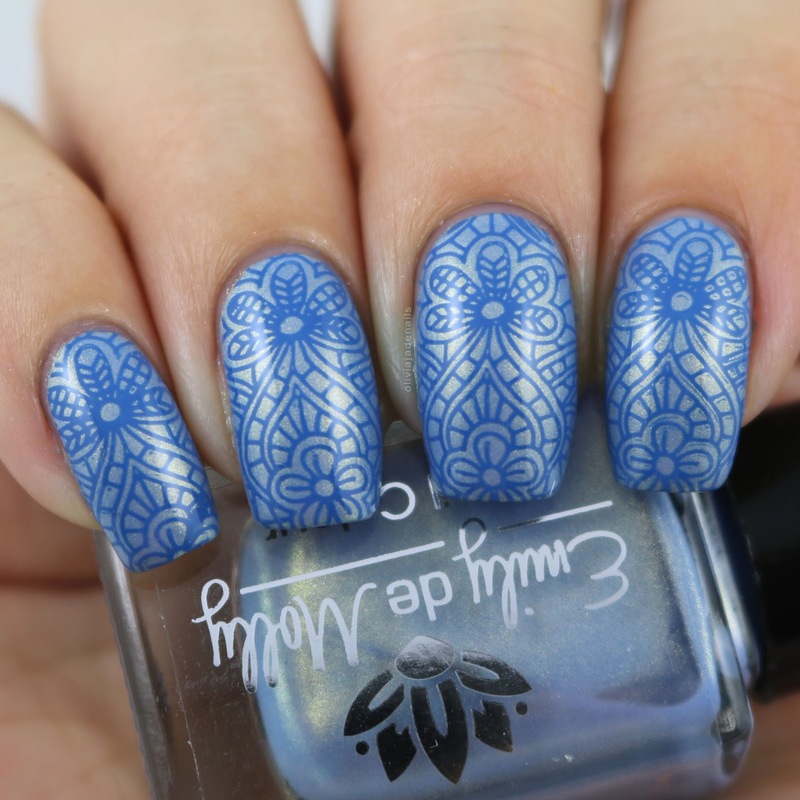 Stamping is done using Powder Perfect's White Stamping Polish and Bundle Monster's BM-XL212. Fairies are such pretty little magical things that I definitely needed to include them in this week's Digit-al Dozen Mythical Creatures theme. 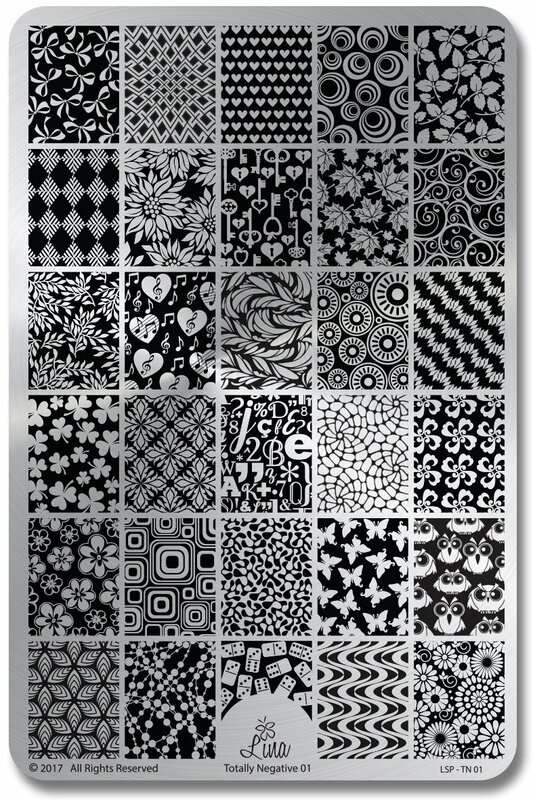 I was being lazy and couldn't be bothered going upstairs to flick through a million stamping plate folders (just a bit of an exaggeration there) so I hit up Google to see what images were possibly in my collection. 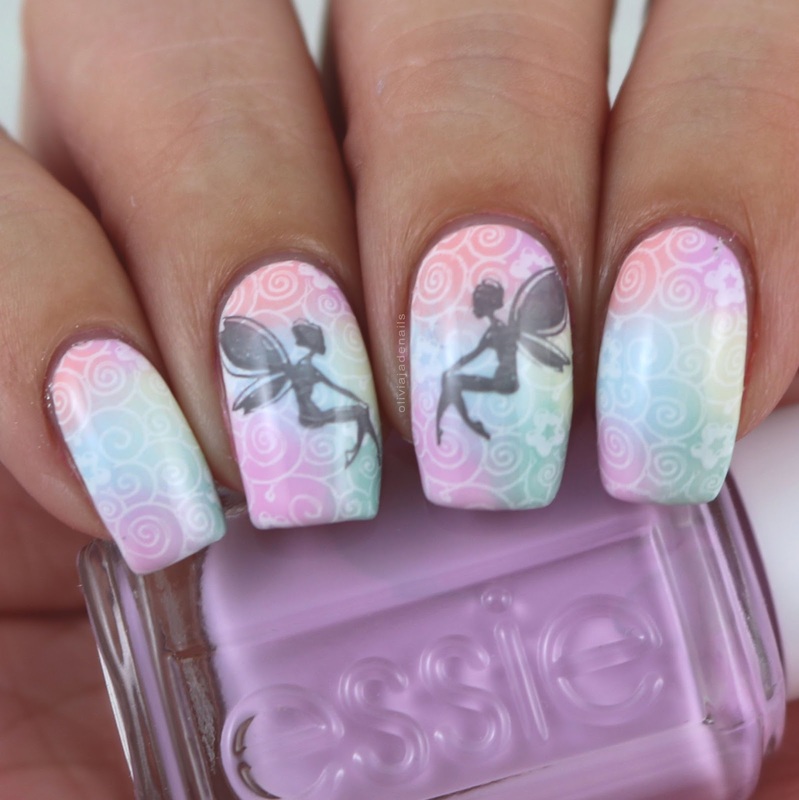 I just so happened to stumble across a gorgeous fairy mani by Serene (Copycat Claws) that I just had to copy. Well it's not really a copy, it's more inspired by. For my base I sponged on Essie's Mint Candy Apple, Saved By The Belle, Chillato, Blue-La-La, Van D'Go and Baguette me not. 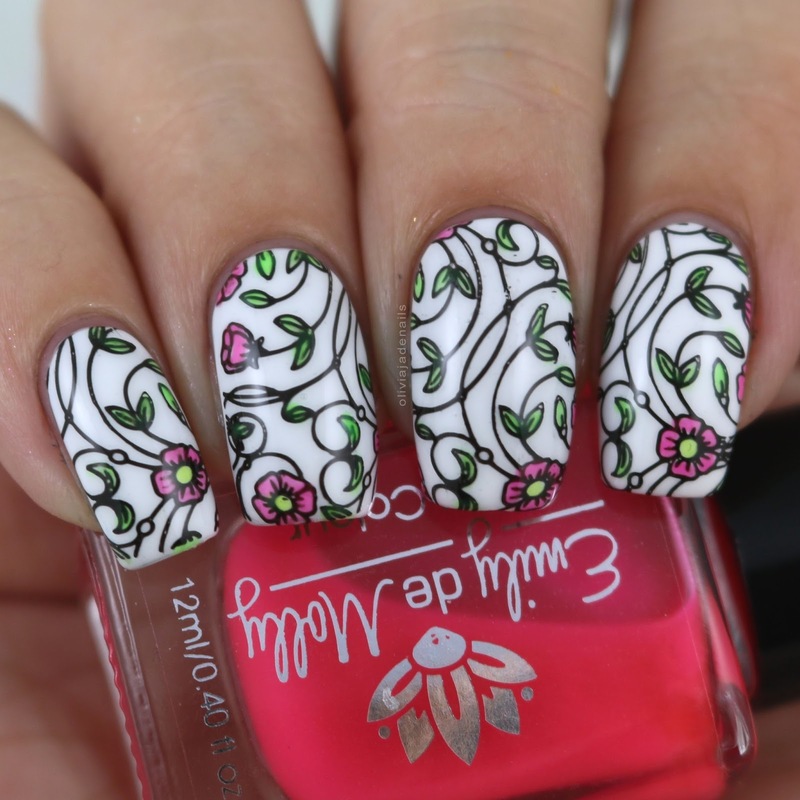 The full image is from Uberchic 7-03 and is stamped using Powder Perfect's White Stamping Polish. 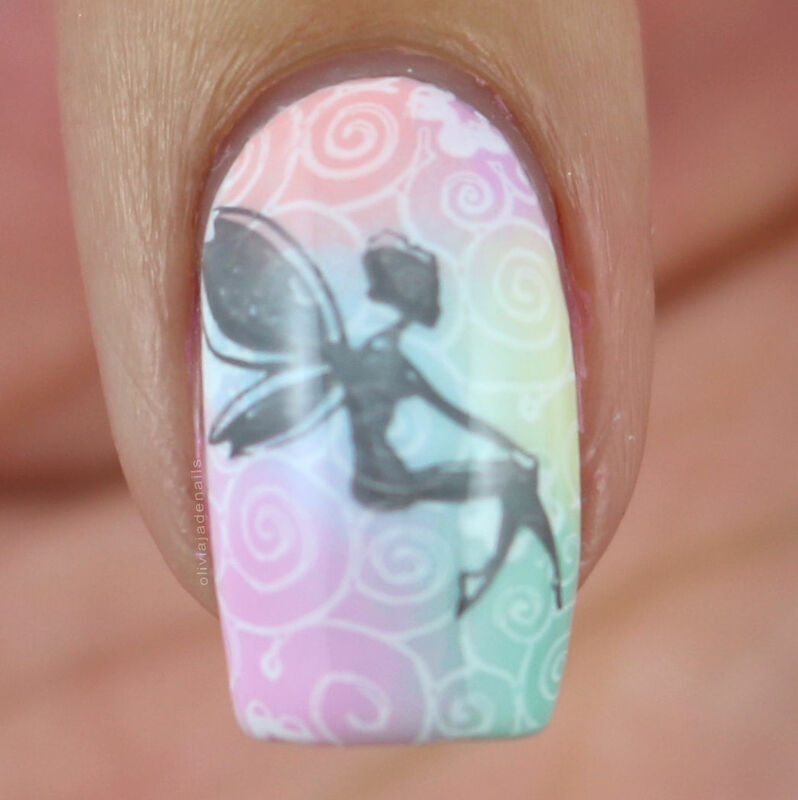 The fairies are from Winstonia W202 and are stamped using Hit The Bottle Looking For Mr Grey. It's Digit-al Dozen week again! This week's theme is Mythical Creatures. To be honest, this is one of my least favourite themes that we will be doing this year. I actually wanted to skip it, particularly because I am not a big fan of theme but also because I am in a little bit of a nail funk at the moment. I am definitely lacking the motivation to paint my nails, let alone do nail art. Anyway, I'll be pushing through this week and hopefully finding my motivation again. I thought dragons were a great place to start with this week's theme. 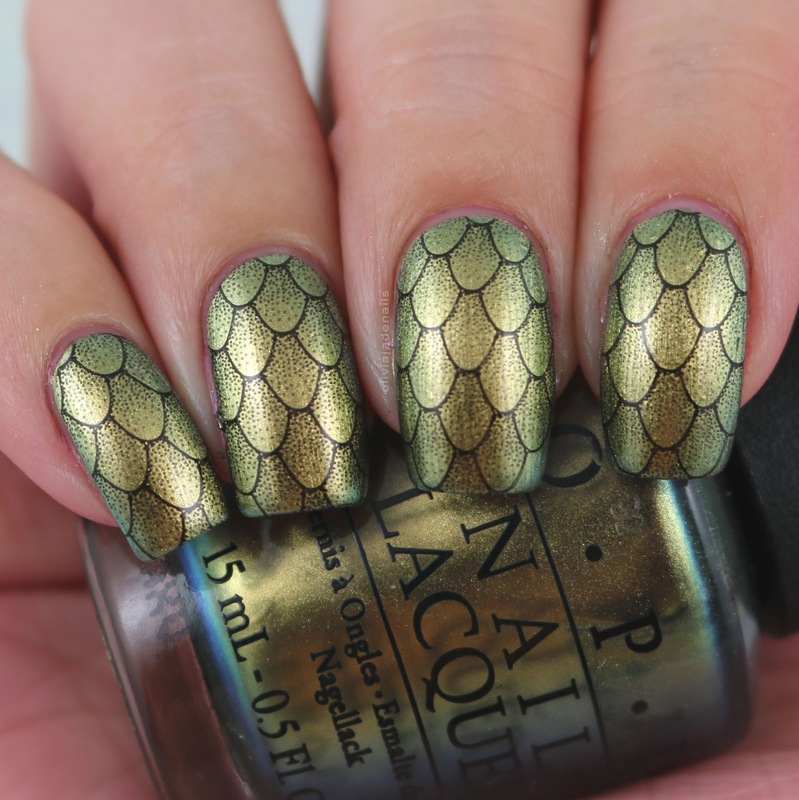 I absolutely love this dragon scale image from Powder Perfect's Kings & Castles 1 plate. I love the extra detail in it. For my base I used OPI Just Spotted The Lizard and stamped using Hit The Bottle's As Black As Night. I'm so excited to see the other girls manis. I just know there is going to be some amazing manis coming out of this week. Life has been really busy for me these last couple of weeks, so much so nails have had to take a bit of a backseat. After the crazy days, I really just can't be bothered painting my nails. Hopefully I will be back into a bit more of a regular posting schedule soon. 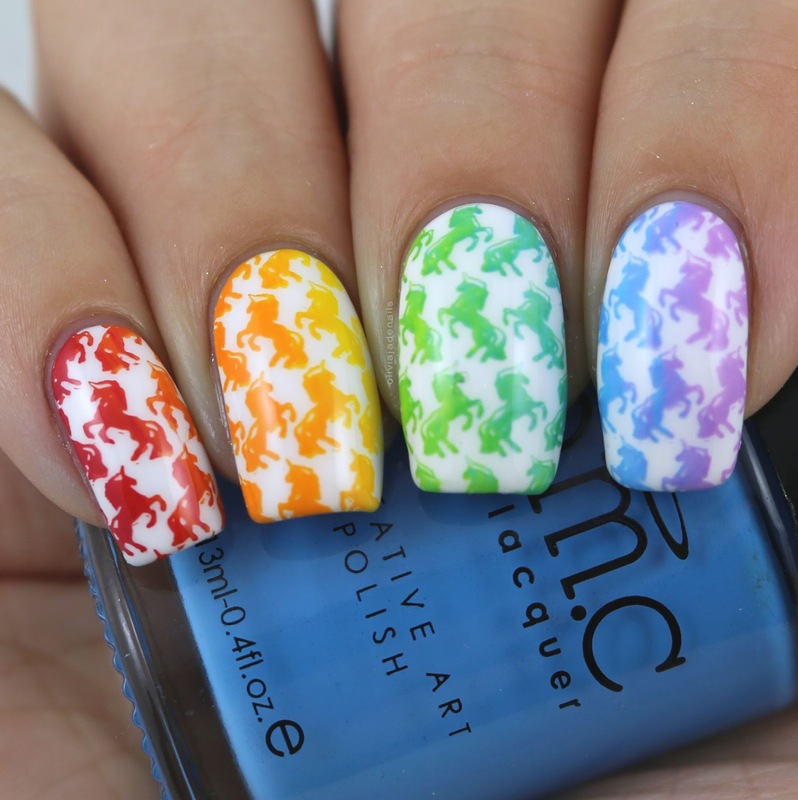 Anyway, today it is time for another 26 Great Nail Art Ideas mani. The theme is Love But No Pink Or Red. For this mani I used Pretty Serious Cosmetics Presence and stamped using Hit The Bottle's Blueberry Dewdrops and Iced Mauve-ijito. Stamping image is from Uberchic Love & Marriage 04. Happy Valentine’s Day everyone! Unless you are like me and don’t celebrate/care for Valentine’s Day then Happy Wednesday! I hope your week is going well so far. I’ve been busy trying to clean out and organise my daughter’s bedroom and toy room. It’s definitely something that is taking a lot longer than I had originally planned. Anyway, I’m getting side tracked here. Today I have Emily de Molly’s Valentine’s Trio to share with you. 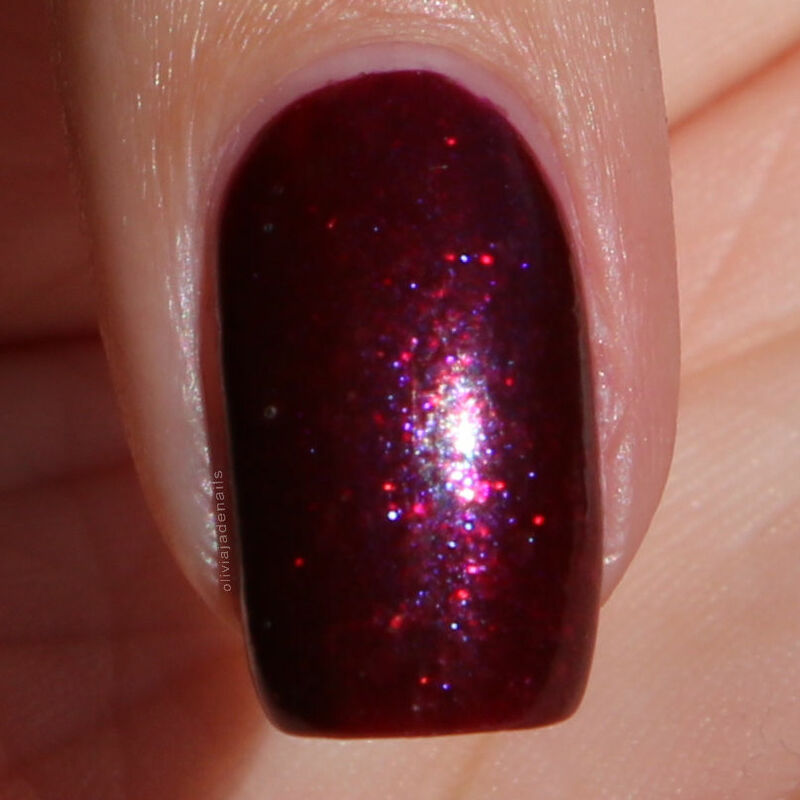 Memory Maker is a dark raspberry red with blue shimmer and copper flakes. Can lean more purple depending on lighting and number of coats worn. This is definitely my favourite of the three. I think it is such a stunner colour and I love that it looks slightly different depending on the lighting. I don’t think my pictures do it the justice it deserves. For me swatch I used two coats. 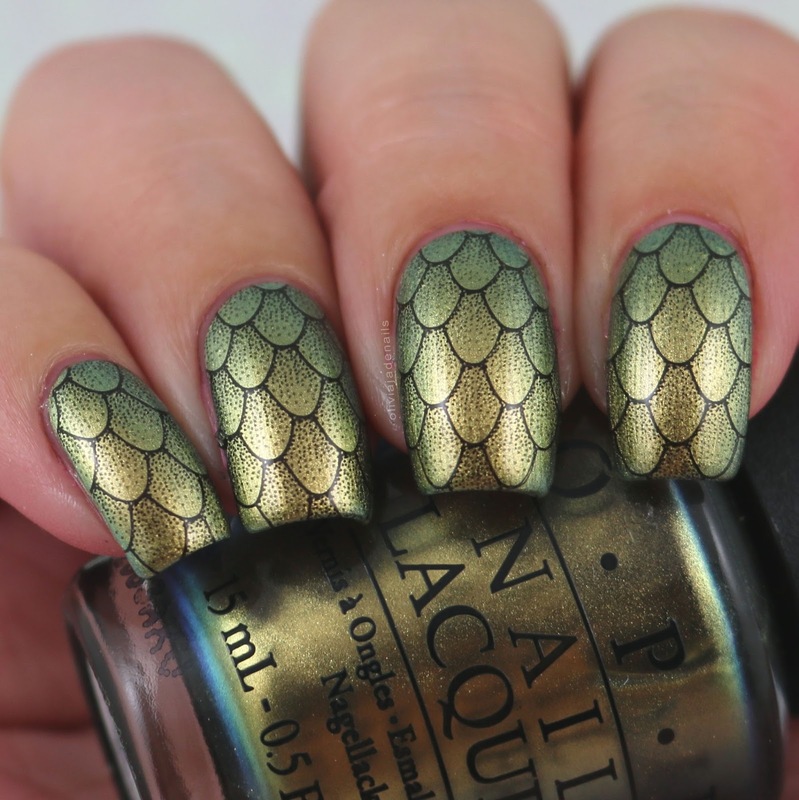 Streams Of Gold is a light pink foil holo with gold to green shifting shimmer. Another favourite of mine. Such a pretty colour with a great formula. Again my swatch shows two coats. 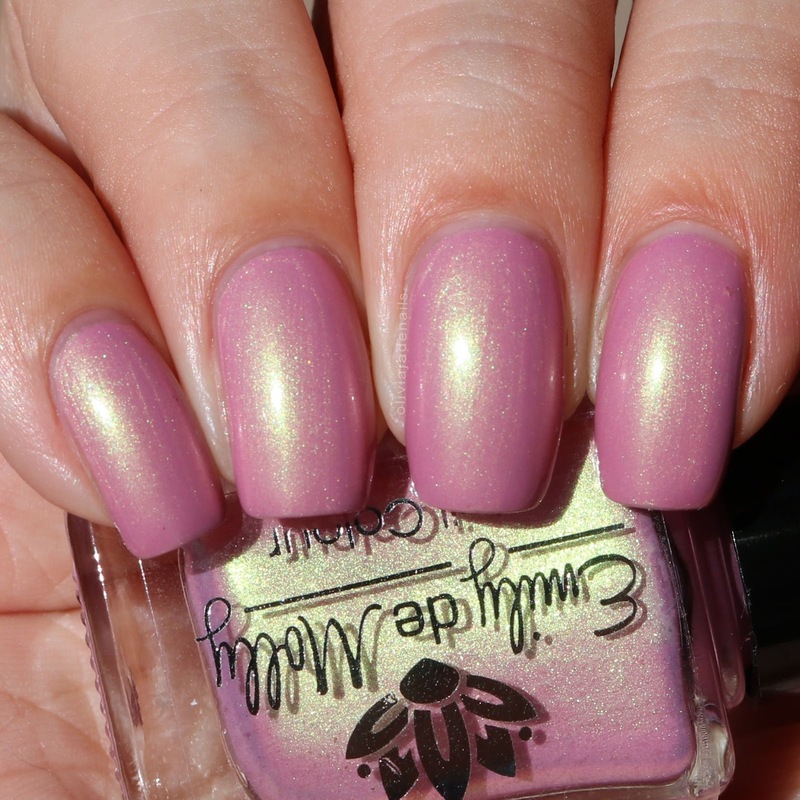 Timeless Feelings is a dusty pink with green to pink shifting shimmer. Now this one I am a little in the fence about. I really like it in the bottle, but I am not sure if I like it so much on me. The formula is good and is opaque in two coats. Overall I really like this trio. I can see me getting a lot of use out of Memory Maker and Streams Of Gold. The Valentine’s Day Trio is available now from Emily de Molly's Australian site and their international site. I was recently shopping on the Hit The Bottle website (they have some new pastel stamping polishes that I needed in my collection - I will be doing swatches and a review of the collection very soon) when I thought I would have a quick look at some of the stamping plates. Luckily for my wallet, a lot of what is available I already one, however there was the new Love Is Everywhere stamping plate by What's Up Nails available so I grabbed it. When it comes to heart images you just need to use pink polish (well you don't have to but I like to). For my base I sponged on three pinks from OPI - Pink Friday, Shorts Story and Apartment For Two. I then stamped using Powder Perfect's White Stamping Polish. I really like this next design. It's so unique and interesting. I just wanted to go for something simple with it and I am so glad I did. I have actually been wearing this mani for the last couple of days. Polishes used are Emily de Molly Streams Of Gold and Hit The Bottle As Black As Night. Overall, I really like this plate. I think there are some really great images on this plate and they stamp beautifully. If you are in the market for a girly plate this is one that you should pop on your wishlist. 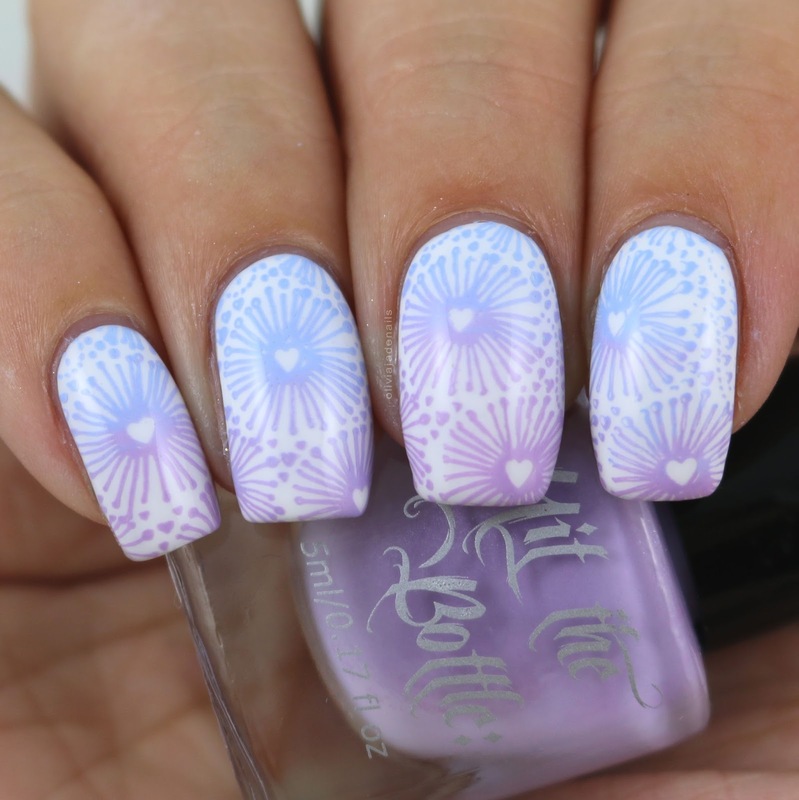 The Love Is Everywhere stamping plate is available now from What's Up Nails and Hit The Bottle.